Hoffenheim vs Leverkusen is often called El Plastico, the game, however, was fascinating with Bayer, led by Leon Bailey, securing a famous 4-1 victory. Leon Bailey continues his good form with a goal and an assist. Leverkusen move into second place in the Bundesliga standings. Andrej Kramaric’s goal was too little too late. Head coaches Julian Nagelsmann (Hoffenheim), and Heiko Herrlich (Bayer Leverkusen) set up their sides in a 3-5-2 and 4-2-3-1 formation respectively. The result was a first 20 minutes that were highly tactical with Bayer Leverkusen having the better of the two sides with 63% ball possession without making any penetrating runs. As a result, it was Hoffenheim that had the first chance of the game. Dennis Geiger cut in from the right and had his cross deflected by a Bayer defender the ball curled past Leverkusen goalkeeper Bernd Leno, and only the crossbar kept the ball out. Following the chance by Geiger Bayer took back control. But like it was the case in the early goings the Werkself struggled to break through a well structured defensive line. Hoffenheim in the meantime tried to break forward whenever they won the ball quickly. Well organised in midfield Hoffenheim’s game entirely focused on centre midfielder Geiger, who worked like a metronome in Hoffenheim’s midfield. The first half threatened to end with a dull 0-0 draw until Leon Bailey came up with a true piece of magic. Receiving a low deflected cross inside the box Bailey had to turn to stop the ball, facing away from the goal Bailey chose to backheel the ball and the shot beat Oliver Baumann to make it 1-0 for Bayer Leverkusen. Hoffenheim stormed out of the gate in the second half. Lukas Rupp hit the post within a minute of kickoff and moments later Steven Zuber saw a shot go just wide of Bayer Leverkusen’s goal. Hoffenheim seemed to be getting back into the game, but instead, it was Leverkusen that struck again. Playing the ball nicely around Hoffenheim’s box the ball fell to Julian Baumgartlinger 18-yards away from goal, and the Austrian finished off the play with a clinical finish that left Baumann scrambling for the ball. Nagelsmann reacted taking off Lukas Rupp, Emir Bicakcic and Florian Grilitsch for Andrej Kramaric, Mark Uth and Nadiem Amiri. The more offensive approach gave Bayer more room and Julian Brandt almost capitalised right away breaking free from Hoffenheim’s defence going one-against-one with Baumann, but the German national team winger put his shot just wide of the goal. In the 70th minute, Bayer put the game to bed. 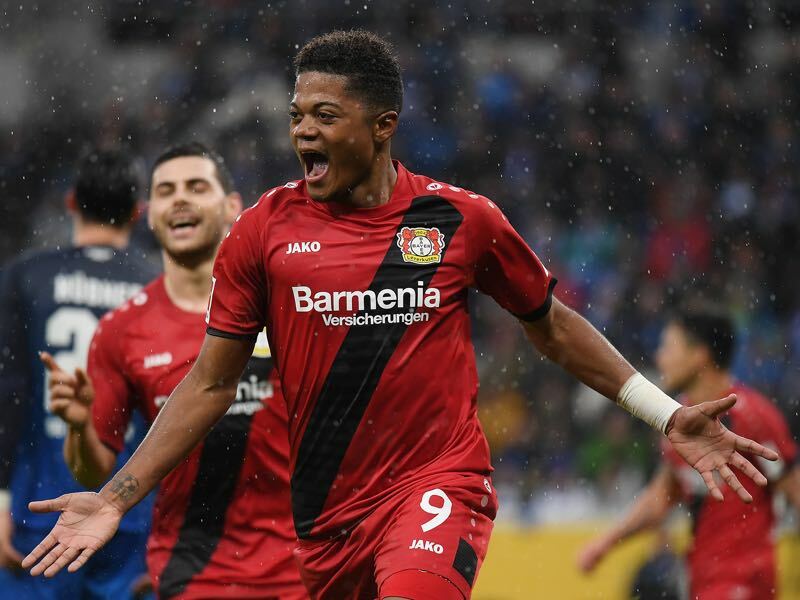 Leon Bailey once again drove forward an attack, and the Jamaican magician played a marvellous pass through to Argentine forward Lucas Alario, who had sneaked away from his defender on the left corner of the penalty box, receiving the ball Alario curled the past Baumann with a one-touch half-volley. 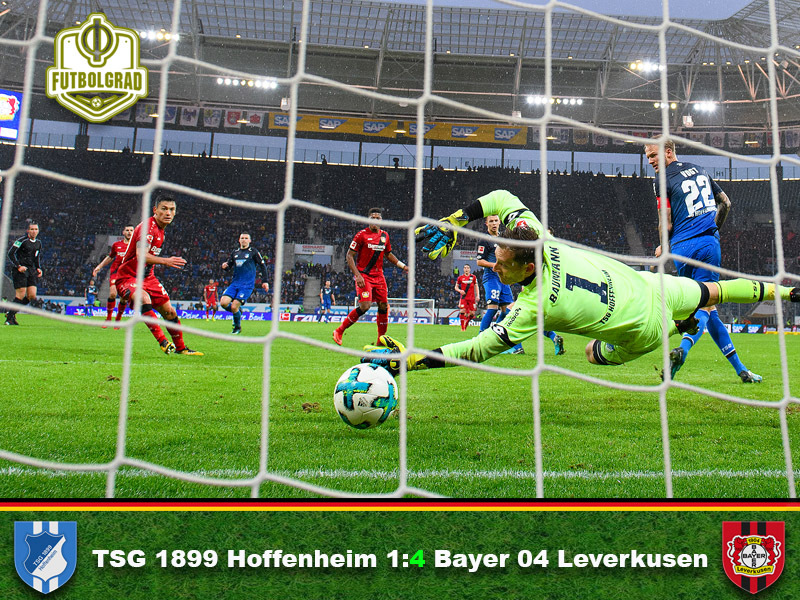 With the third goal in the back, Leverkusen controlled the game almost until the final whistle and only a defensive lapse in the 86th allowed Hoffenheim to score with Andrej Kramaric jumping on a loose ball breaking through Leverkusen’s defence and chipping the ball over Bernd Leno. It was, however, too little, too late, and Leverkusen managed to add another goal in injury time with Alario tapping in a great cross by Panagiotis Retsos. Leon Bailey had a fantastic afternoon in Sinsheim. The Jamaican attacking-winger scored a fantastic backheel goal and then assisted Lucas Alario’s goal with a marvellous pass. But it was not just the goal and the assist that defined the Jamaican’s game. Bailey was all-present at the game slaloming through Hoffenheim’s midfield at will at times. With that kind of performances, it is only a question of time until big money offers will arrive for perhaps the most exciting player in the Bundesliga at the moment. With Bayern München dominating the Bundesliga at will the field behind the Bavarians is now led by Bayer Leverkusen, who are now second in the Bundesliga standings following matchday 19. The Werkself have made a significant step forward under Heiko Herrlich and with the side including several highly talented players look set to become a challenger for the top of the table in the long-term. Kevin Volland (ten goals) and Mark Uth (nine goals) were the German top scorers in the league ahead of matchday 19. Neither scored in the game. Timo Werner’s goal for Leipzig means that he now together with Volland leads the statistic. Bayer’s 39 goals means that only Borussia Dortmund and Bayern have scored more often in the Bundesliga.